Great to store bikes or a small cupboard for garden tools. 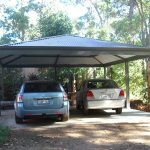 Having DIY carports might seems like a daunting task, but you’d be surprised at how simple and easy they to install if you have the time and skills. DIY carports stand for Do-It-Yourself carports. They are carports that come in kits so you can put them together on your own or with the help of one or two other people. They are also a project that can be installed quickly (full kits have all the components you need). Your new carport can be generally be built over a weekend or during a couple of days you have off from work. What makes DIY carports a good choice? You don’t have to pay for the installation process. You can have the kit as a standard sizes or you customized to your exact requirements. You don’t have to buy specialized tools as basic tools will be enough to help you installing your own carport. DIY kit can be delivered right to your home. This is great because you don’t have to worry about how you will get your new carport kit home. You must apply for a building permit and abide by your local government rules when building a new carport even if it is from a DIY Carport Kit. CPR Outdoor Centre can supply you with a full DIY kit from out standard range or customized to your exact requirement or if you would prefer we can handle everything including the building permit with a fully installed carport. Come and have a chat with CPR Outdoor in Bunbury and Busselton to discuss your needs or fill in our quote form. Are you not tired of compromising your car out in the weather just because you don’t have a place for a decent parking? Hot in summer, you get wet in winter and that damp smell! It is not doing your car any good or you for that matter. If you don’t have the budget to build a garage, a carport is your perfect solution for you. As an added bonus to having a carport, it can provide an extensional covered area if you need more room for outside entertainment. Basically speaking, you have several options of materials to use for your carport. At CPR Outdoor Centre we use BlueScope steel to make sure your new carport will be the superior quality possible. Quality finish is assured with your selection of colour from our Colorbond powder coated range. Choose a nice location or spot. Should it be attached or freestanding? Another important decision that you have to consider when planning your carport is the location. Whether you want to have a carport attached to the side of your home or just freestanding structure your location for your new carport is very important. 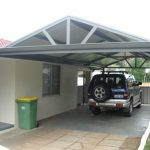 An attached carport is joined to the structure of the house, while freestanding carports are independently designed to stand by themselves anywhere in your property. When it comes to carport designs, you can always choose from a range of standard styles. All of which are proven to be attractive, from basic styles to having extra features like decorated gable roofs, finials and more. CPR Outdoor Centre, we offer professionally designed carport for you so that it seamlessly matches your home theme. This not only refers to the shape of the carport but to the colours as well. CPR Outdoor Centre will do all your council permits for you. If you are doing a DIY carport before you do anything else, you must first check your local council to make sure your new carport will comply with their rules. That is because some suburbs have different planning legislation and caveat that apply to your area; each local council can have slightly different regulations regarding building. Or we can make it easy – just 1 step. Call CPR Outdoor Centre will do everything for you from all your council permits to the design to complete installation. CPR Outdoor Centre are your carport specialist. We offer DIY and installation services for patios, carports and garages. Call us now for a FREE quote! How much does it cost to build a gabled carport? Want to build a gabled carport? Find a good place to build the structure. It can be either attached to your home or freestanding, but the most important thing is the place should be spacious enough to park your car and take note of power lines and sewage tanks so you don’t face any issues when digging. Consider the weather and wind in your area, if you build too far from your house will you get wet in the winter trying to get back to your house. If the carport is attached to your home will the wind blow the rain in if it on the exposed side. These are things to conside in regard to location of your new carport. Check with your local shire to make sure of what building regulations and codes you need to ahead here to. This will help you avoid unwanted legal problems in the future which might cost you hundred dollars or prevent you having to have your carport removed because it doen’t comply to the building code. Different materials have different prices. If you go for quality materials, you can be sure that your carport will stand the test of time. Colourbond is perfect for Australian conditions and colours can match your home. When it comes to materials you should always get what you pay for. Avoid wasting materials by buying a carport that doesn’t fit your exact deisn and requirements. any walls (you might need a side wall from protection if your carport is in an exposure position). This will also help you find the right supplier/company who can offer the best price and give you value for your money. 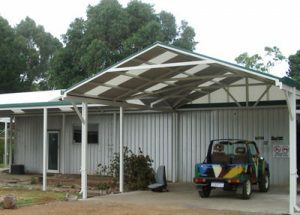 For gabled carports and other designs that will suit your needs, contact CPR Outdoor Centre Bunbury on 08 9726 2311 today! A carport is great and can be a cost-effective alternative to a garage to protect your car, boat or caravan. What type of carport do you want? Will it be attached to the house or completely freestanding? The type of roof can also affect the final price. A flat roof will be cheaper than a gable roof but might not look as good and is limited by the height of you house. Flat roofs are perfect for freestanding carports that are used as protection to cover cars or machinery on a work site, farm or outside your business. Gables and multi gables will give you a lot more options to match in with your existing roof and add a stylish valuable feature to your home. The size of your carport is always a consideration; a larger carport will be more expensive than a smaller one. The advantages of the larger size will usually out way the extra cost. Where you want to have your carport built will also determine the price. Are you having a concrete pad put down first, using a gravel or placing it over the existing surface? CPR Outdoor offers carports in both DIY (do-it-yourself kit) and fully installed. It comes down to the time verses money! Do you have the time and skills to build your own carport from a complete ready to go kit, or would you like to just pay the money and have us look after everything for you? You can add or remove any of these options when you have your carport installed with us. Carports are important. It provides shelter for your car and can provide an extra space to do outdoor entertaining. Speak to CPR Outdoor Centre Bunbury to discuss your exact needs and get a free no obligation quote. Carports protect your investment. Your car can be considered one of the best investments you will make. From the convenience it gives you in your day to day life and it is also valuable as an asset. As a car owner, we would be lost without it. Cars are very essential in our lives and you often we don’t take enough care with it. There are two simple ways to take good care of your vehicle. One is by doing your cars maintenance, check the tyres, oil, fluids and have regular services; and the second is protecting it from potential damage from weather conditions from sun, wind and rain. If your car is not properly protected, the elements can potentially cause a lot of damage to your car. Carports can also give you extra covered space for having a party, entertaining or just a casual Saturday arvo drink with friends. The best solution for you could be a Carport. A carport is a free standing structure than doesn’t have an walls. It is purposely designed to protect cars, vans and trucks and other types of vehicles even a boat. Often, you can see a carport as a free standing structure beside a house, and sometimes it is connected or mounted to wall of your home. Carports are great options for rentals and for the front of your home. Carports vary differently in design and materials used. CPR Outdoor Bunbury and CPR Outdoor Busselton supplies genuine BlueScope Steel framing and sheeting in either Zincalume or Colorbond options for all our carports. You can buy a CPR Outdoor carport as a complete kit read to install yourself or we can do the total install including council permits. We make it easy for you. Sizes.Size definitely matters depending what you would like to cover, how many vehicles you owned and how big they are. If you have several cars with varying sizes, initiatively you’ll need a bigger and wider carport. Yes. Carports can be bigger and wider, in fact there are carports that can fully cover trucks or buses, boats or caravans. Design.This is an important factor to consider. The standard carport design is frame only and has no walls in it. A carport prevent your car from getting wet by rain and being cooked by extreme heat of the mid-day sun. You can have a semi walled option for more protection if you would like to. Carports are proven cost-effective. 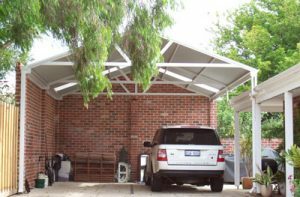 There is a wide variety of designs and styles of carports which will suit every purpose and need. Contact CPR Outdoor Centre for more information and to discuss your needs. Free standing carports offer many advantages, most importantly is having a structure that can be installed anywhere on your property. When deciding which type, style, and size for your free standing carport you need consider these factors – your shelter needs, location, sun position of where the structure will be installed. Make sure you have plenty of clearance from other buildings and especially from trees. The style of structure is entirely up to you and there are many to choose from. Some are completely open, partially enclosed, and there is also a large selection of fully enclosed shelters to choose from. The advantage of choosing an enclosed free standing carport is that you can turn it into more than just a car shelter. Depending on the size you choose, you can also have added space for storage of other items and in addition, plenty of sheltered workspace for working on your car or other projects. Many of the arched root style shelters offer a great attic space that can be converted to a storage area with a few adjustments. Great extra space for a BBQ or party. If you are a handy individual, you can even opt for a DIY kit option, supply your plans and we will build to your specifications. Want us to do the lot – council plans, permits, build, with CPR Outdoor Centre is the right place for you.